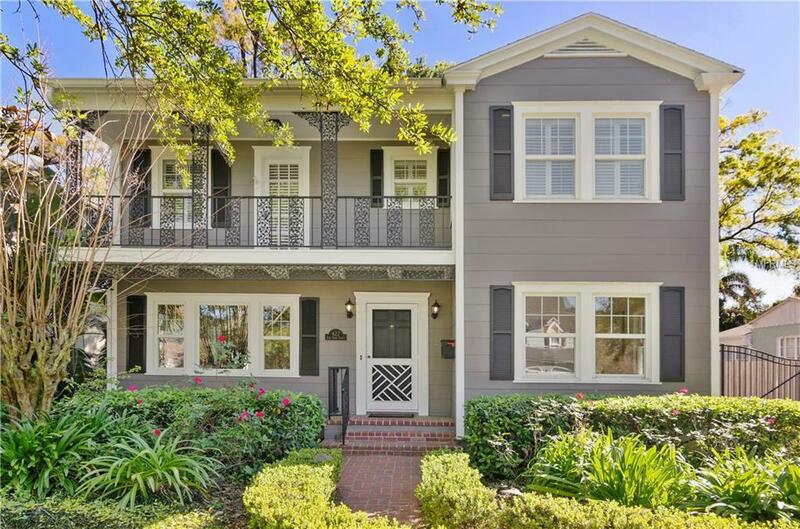 Delaney Park Gem with the ultimate in quality upgrades on a brick lined street just minutes from Downtown. This unique property features a main home with 3 bedrooms AND a separate DETACHED APARTMENT (potential income producing) complete with kitchen efficiency, loft and washer/dryer. Living space in the main home includes a large living and dining room both with gorgeous WOOD FLOORS. Enjoy an UPDATED kitchen complete with custom cabinetry, stainless steel appliances, GAS range, tile backsplash and breakfast bar. The kitchen opens to the family room with rich wood beams, French doors, GAS fireplace and built in cabinets. The master suite is light and bright with vaulted ceiling, hardwood floors and an UPDATED (2012) bathroom with MODERN double vanity, glass surround shower and custom lighting. Step out onto the front balcony, a perfect spot for winding down after a long day. A unique secondary bedroom features two connected rooms, which is great place for someone that needs additional space. The third bedroom includes wood floors and great storage. Privacy lovers will enjoy the 12 electric aluminum gate and fully FENCED backyard with mature landscaping. A BRICK patio and a wooden deck with PERGOLA make a perfect place for entertaining family and friends. Additional amenities include landscape lighting, tankless water heater and new windows.This home is located just steps from Delaney Park and Lake Cherokee and is in the desirable school district of Blankner (K-8) and Boone High school.